DNA Gedcom reads your DNA data from Ancestry, 23andMe, FamilyTreeDNA and MyHeritage, and produces spreadsheets which can be loaded into RootsFinder's DNA Tools. To get started, see How to Get Started with DNA Gedcom. Note: You must import your spreadsheets in order. First import the matches, then the segments and finally the ICW. 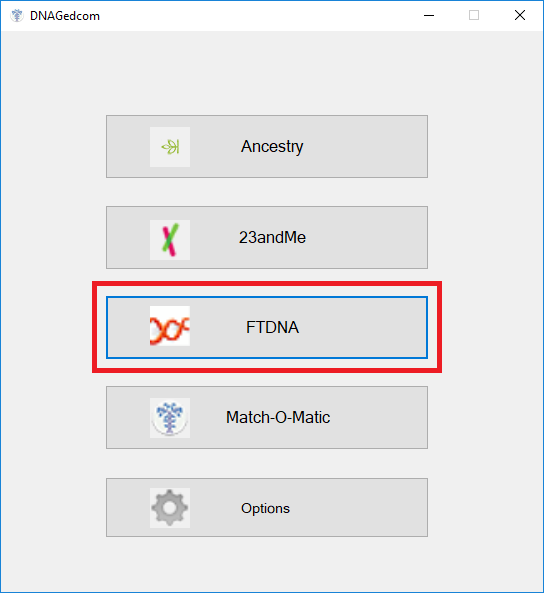 After you have set up DNA Gedcom and made sure to select the export folder for your spreadsheets, return to the DNA Gedcom main menu and select FamilyTreeDNA. Now, you need to log into your FamilyTreeDNA account. 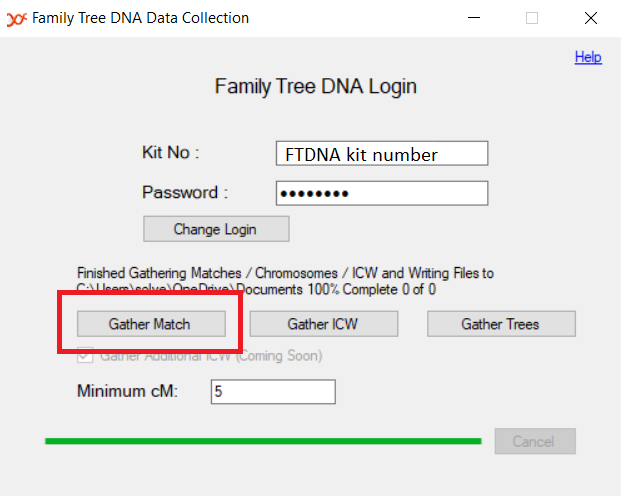 From DNA Gedcom, click on Gather Matches. When it is done, it will generate your matches file and your chromosome browser. When you see this message, your matches have been stored on your computer. Note the location of the file is specified in the message. Hop on back to RootsFinder and click on "Choose File." Click on the file entitled with "your FamilyTreeDNA kit number_Family_Finder_Matches" in your export folder. After the matches load, click on the down arrow in the blue circle to open the DNA menu. Select the second icon for your segments. 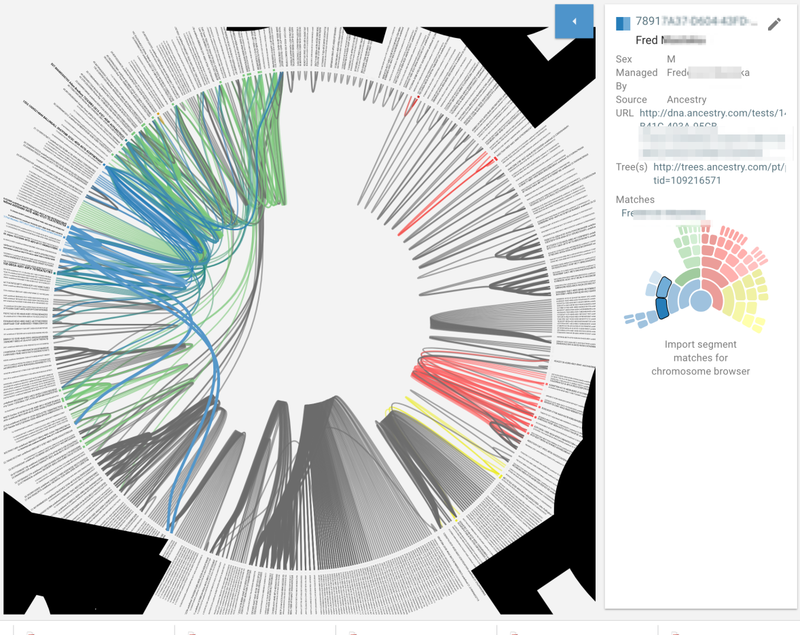 The FTDNA Chromosome Browser was downloaded at the same time as your matches. You don't need to access DNA Gedcom for this step. Click on "Choose File." Select the file entitled "FamilyTreeDNA kit number_ChromosomeBrowser." Note: segments are limited to a maximum of 5000 matches. 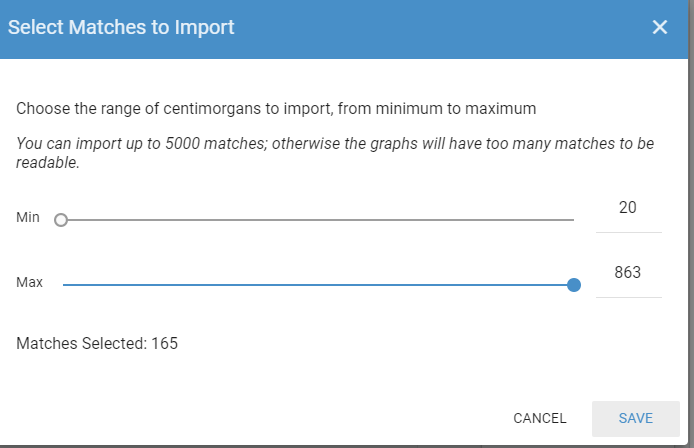 You may set the minimum and maximum number of matches on the next screen. Click save. You may want to limit the segments to less than 5000. 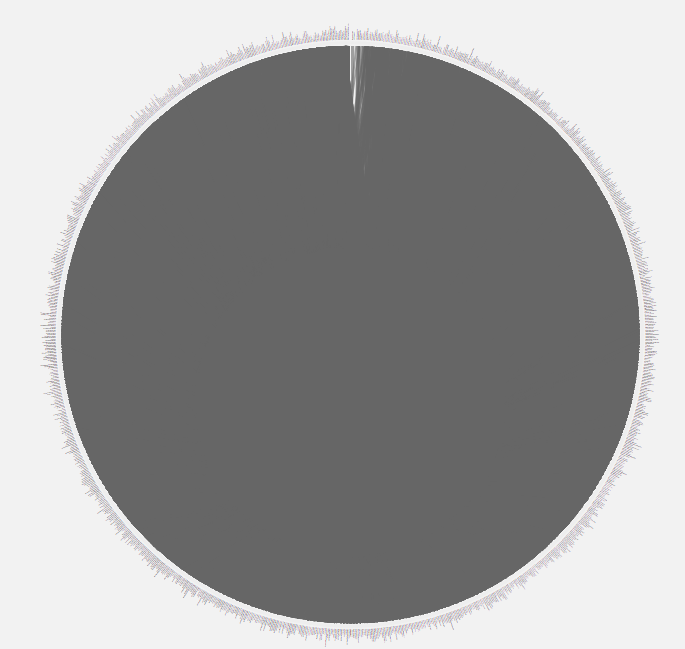 Here is a circle view with too many matches to be useful. There are so many matches that they create a black circle. 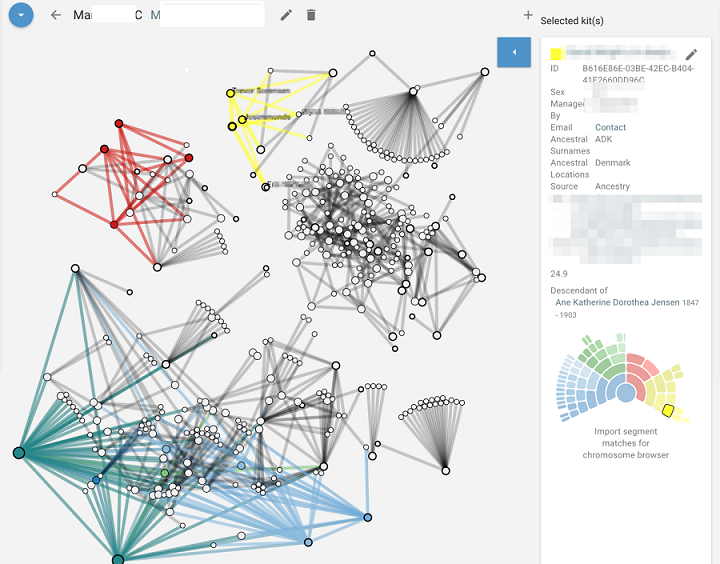 This circle view has fewer matches and can be analyzed. After your segments are loaded, you will want to load your ICW data. 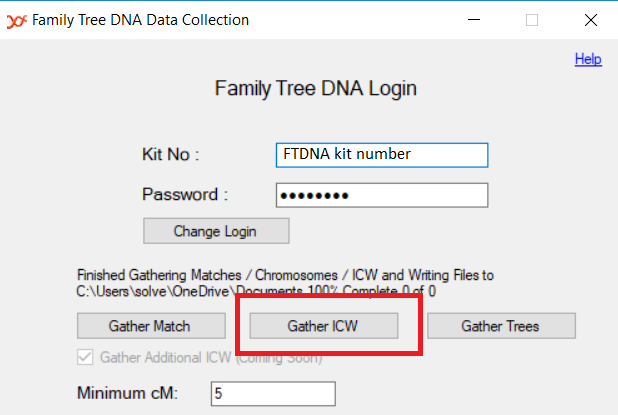 Skip back to DNA Gedcom and click on Gather ICW. This is going to take a while. Take bubble bath and eat some chocolate. Now its time to hop back to RootsFinder. Click on the down arrow in the blue circle to open the DNA menu. Select the third icon with the triangle in it and click on "Choose File." 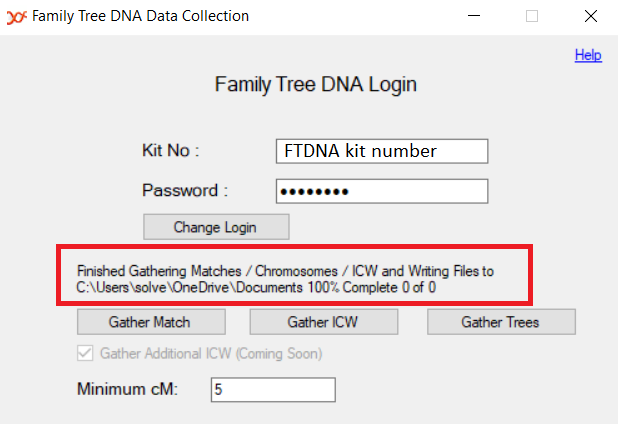 Select the file entitled "FamilyTreeDNA kit number_ICW." Note: ICW is not the same as triangulation although the results will appear on the triangulation view. ICW means "in common with." This means that kits shared segments with you and with each other but not necessarily the same segments. Triangulation means connected kits share the same segments. The information in the kit view window at the right is a combination of what Rootsfinder imports for you and info you have filled in. Clicking on the URL will take you directly to the matches Ancestry page. Other information can be added in the notes tab and this will show here on the summary. You can keep all your info in one place. In the left panel you can see I have recorded some ancestral names and locations, and noted that she lives in USA and is 97 years old. For detailed information on Kit view please seeKit Basics and Kit View Matching, Color Coding, Chromosome Browser and MiniTrees.